Why is Rome called the Eternal City? It’s because ancient Romans believed that no matter what happened to the world or how many empires came and collapsed, Rome would go on forever. This is our 2nd time visiting Rome, and both times we seem to discover something new or a new vantage point. There’s just way too much history, art, culture, etc. to take it all in on one visit, even though we had 3 days. At the bottom of the Spanish Steps. 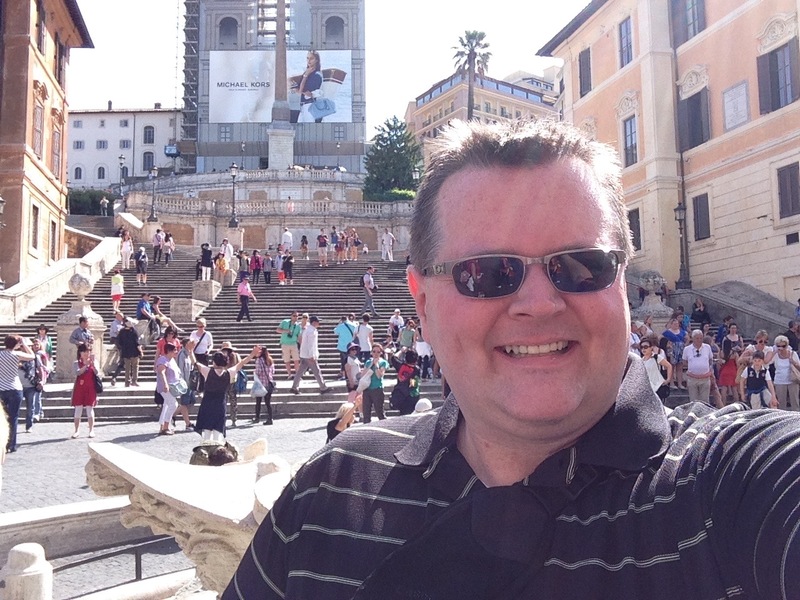 Our last visit to Rome was in mid April 2013, and the temperature was about 10 degrees Fahrenheit warmer this time. It is early morning (10am is early in Rome), so the Steps are not crowded. But, by late afternoon, hundreds of people will be here sitting on the steps people watching. The Altare della Patria (Altar of the Fatherland) was built 1885-1925 for the first King of an unified Italy (before this time period Italy was made up of several kingdoms). It is made of marble like most of the Roman buildings were, but the ancient buildings are now brownish, while this white stands out. But, it helps the imagination to envision how ancient Rome must have looked like with all the white buildings. Our last visit was in early April 2013, and the difference that 6 weeks makes in visiting Rome is noticeable. From the warmer temperatures to the larger crowds, it starts to get real busy with more tourists arriving as the summer holiday season approaches. And, Rome does feel like one of those places that will draw you back for return visits in the future. 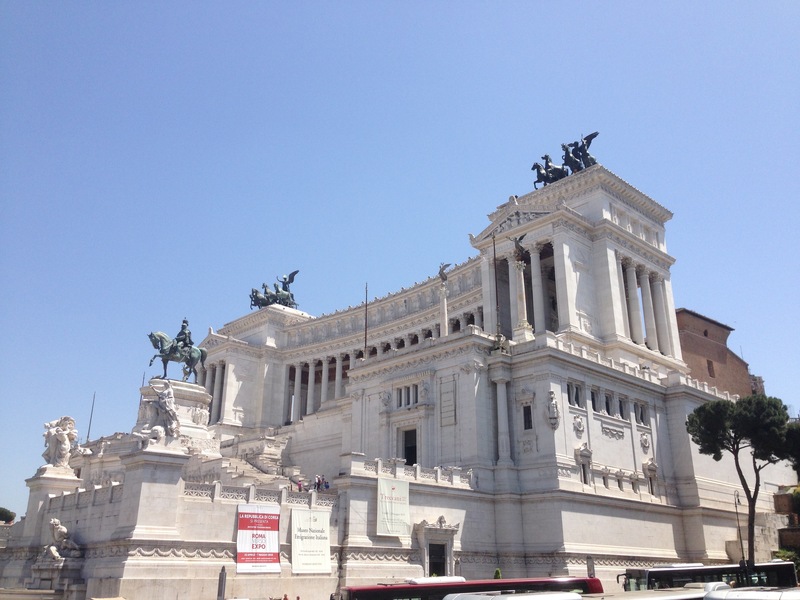 We spent 2 days in Rome prior to leaving for our western Mediterranean cruise. And, then our 3rd day in Rome was our last cruise day as we did one last tour before transferring to the airport. 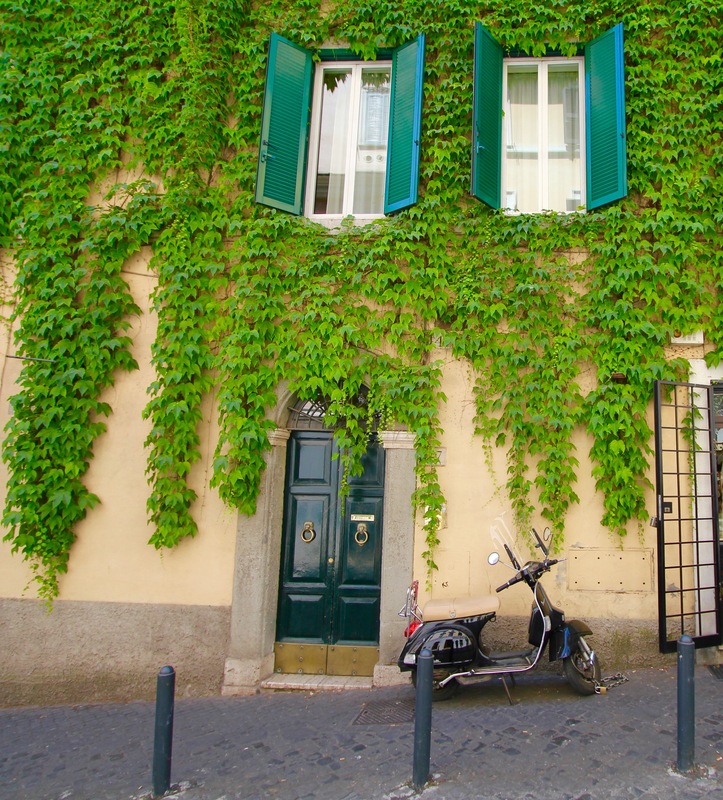 And, when you get lost in Rome, you can find charming side streets like this one that instantly creates a postcard setting. Walking: Bring comfortable walking shoes. And ladies, forget the heels if you plan to walk any of the Roman streets with their cobblestones or bricks. 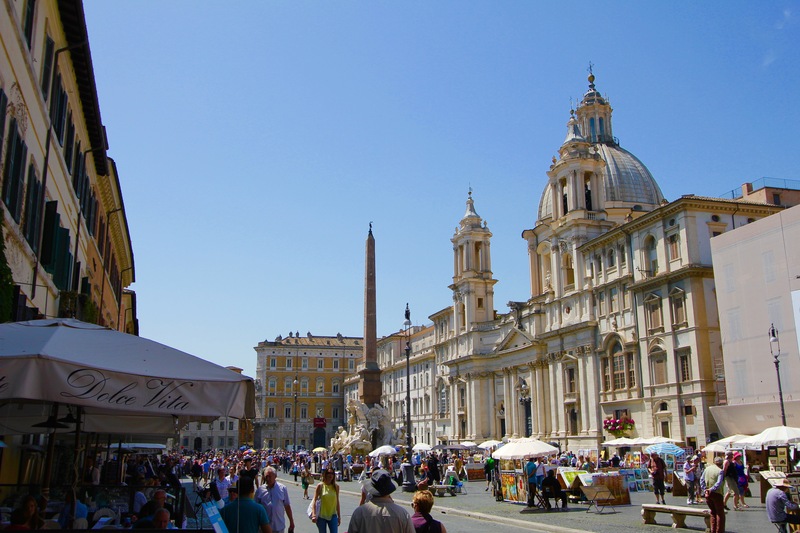 The center of Rome can easily be walked in a full day. Our hotels have been close to the Borghese Gardens, so starting there it is easy to walk to the Spanish Steps, Piazza Navona, the Trevi Fountain, the Pantheon, to the Altar of the Fatherland, Roman Forum, Coliseum, the Circus Maximus, and then we take the Metro back to the closest stop to where we started. This route makes for a full day, but it is well worth it!! Piazza Navona (town square named Navona) built in the 1st Century AD. Now a space for markets of artists lined by cafes. We did the tourist thing and had lunch here. TRAVEL TIP: eat at a cafe a few blocks from popular attractions…while our food here was good, it was twice the cost of other places. Our visit to Vatican City, and the view of St. Peter’s Basilica. We toured the Vatican Museum with all of its artwork: sculptures, hanging art, painted walls, tapestries, etc. And, after an hour through the museum, we then toured the Sistine Chapel, and the famous painted ceiling. The Sistine Chapel is smaller and the famous “Creation of Adam” picture is smaller than one would think. Unfortunately, no pix are allowed in the Sistine Chapel. After that, we then toured St. Peter’s Basilica, and it is AMAZING! 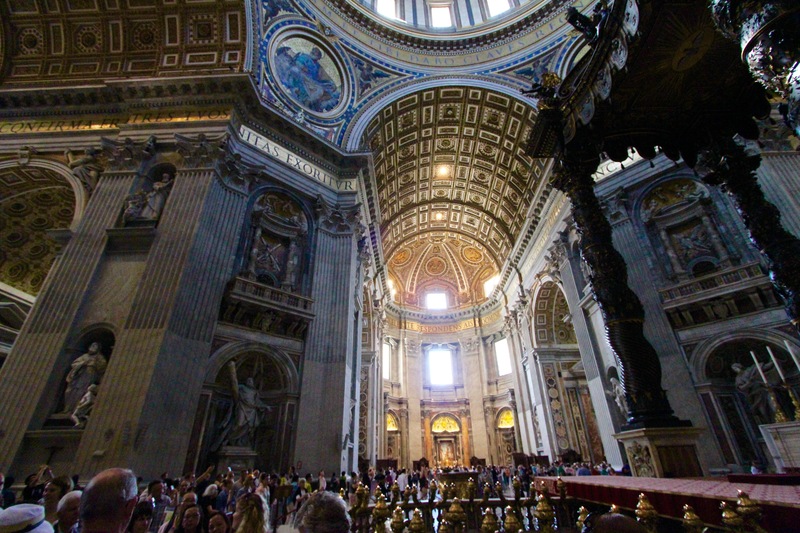 Buy Tour Tickets in Advance: To visit the Vatican City (either the Vatican Museum or St. Peter’s Basilica) or the Coliseum, buy your tour tickets online and arrive early. Buying the tickets online allows you to skip the line in waiting to buy tickets. And the earlier you go, the better to beat the crowds. 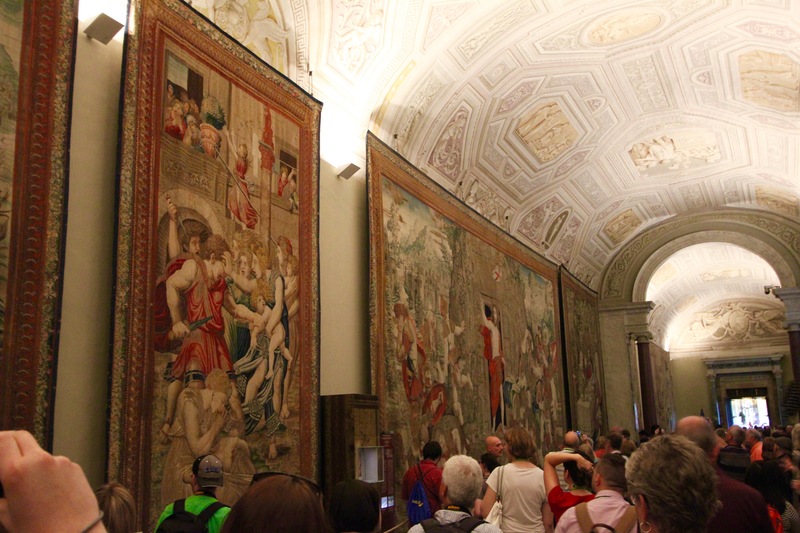 The Gallery of Tapestries in the Vatican Museum. The artwork in the ceiling is flat, but it looks like it is in 3-D. And, along the walls are large tapestries from the 1500s. I left the people in the picture to provide scale to show how large they are. Each one has various religious images woven together. 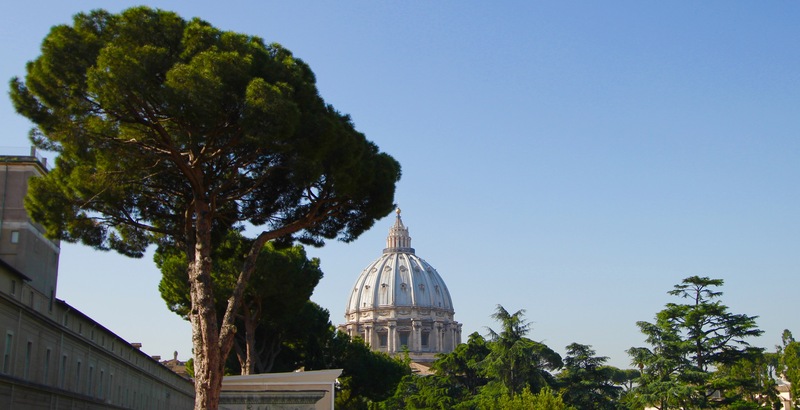 Tour Companies: If you tour the Vatican, consider booking a tour via a tour company. 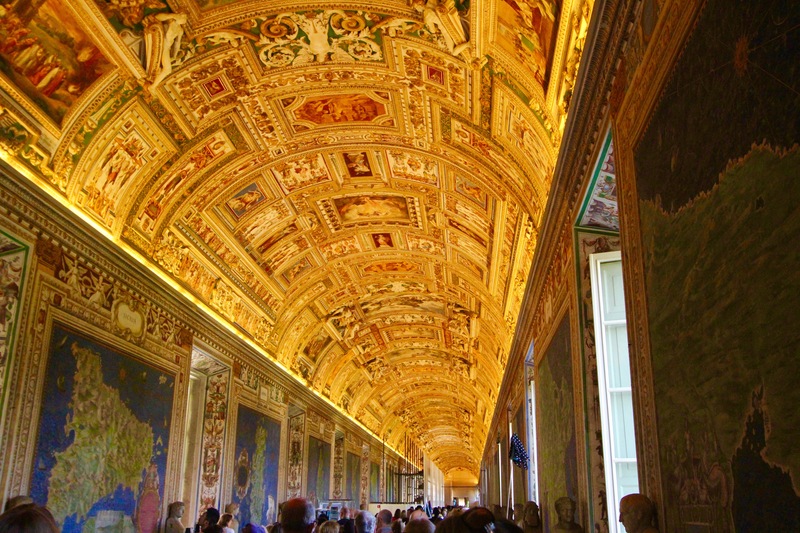 After researching TripAdvisor.com, we selected a tour with a company called Viator and selected the tour of the Museum, Sistine Chapel and St. Peter’s. We had a great experience and an awesome tour guide that was excited to show us all the wonderful things in the Vatican. 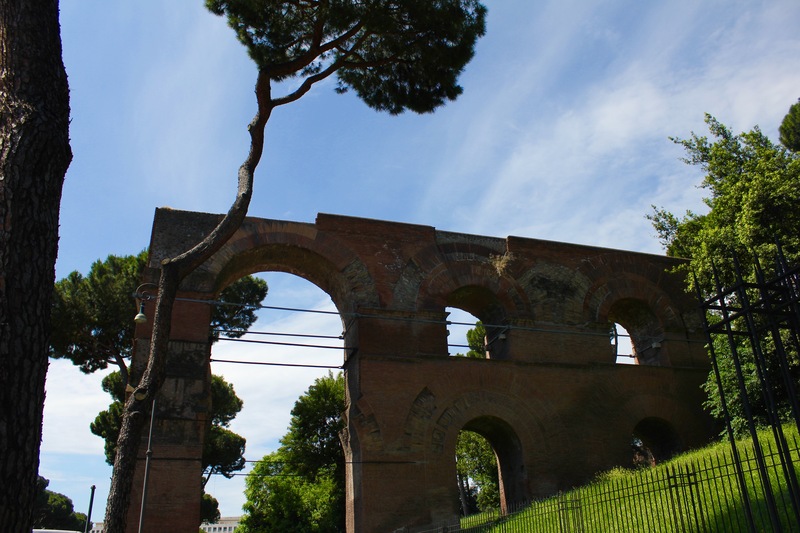 The rest of Rome can be toured on your own, just find a good map and guide book. 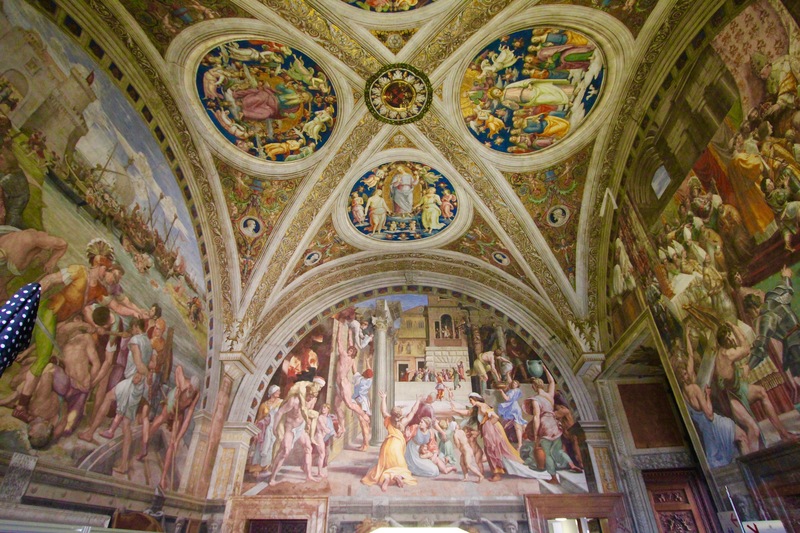 Raphael painted 4 rooms here with each room being used as an apartment for the Pope at that time. Basically, the entire Vatican Museum is the apartment building where various Popes lived. Each Pope wanted various artworks or sculptures made, so over time, each apartment became a museum onto itself. There are so many works of art to share. Honestly, I am not an art person, as in knowing the names and their interpretative meanings….but, I do appreciate beauty and detail. This work is one of the most famous: “The School of Athens” is one of the most famous frescoes by the Italian Renaissance artist Raphael. It took 3 years (1509-11) to complete, and has to be about 30 feet wide x 20 feet tall. 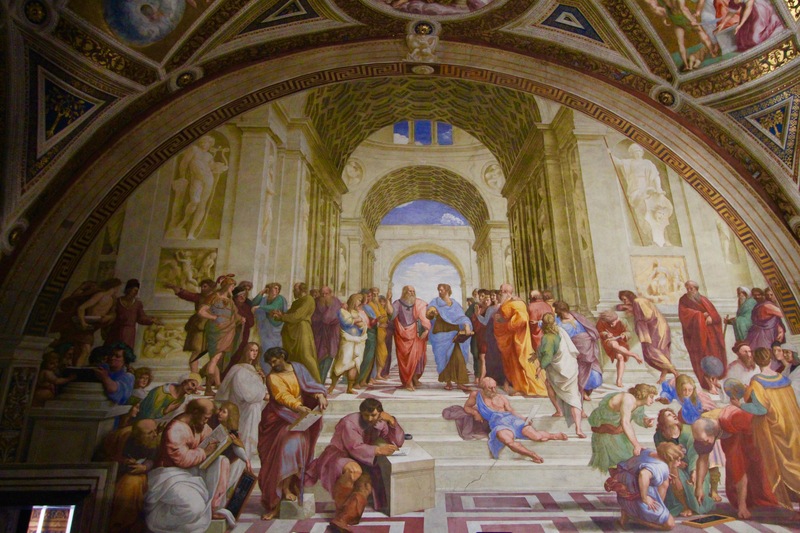 It depicts the “worldly” Greek philosophers and the “spiritual” Christian thinkers discussing the topics of Philosophy, Poetry & Music, Theology, and Law. After touring the Sistine Chapel, we were then led into the St. Peter’s Basilica, which is the largest Church in the world. The last time we visited Rome, we did not go inside…but this time, we did. The height of the dome is high enough that the Statue of Liberty can fit inside!! The altar for the Pope is the large structure on the right. 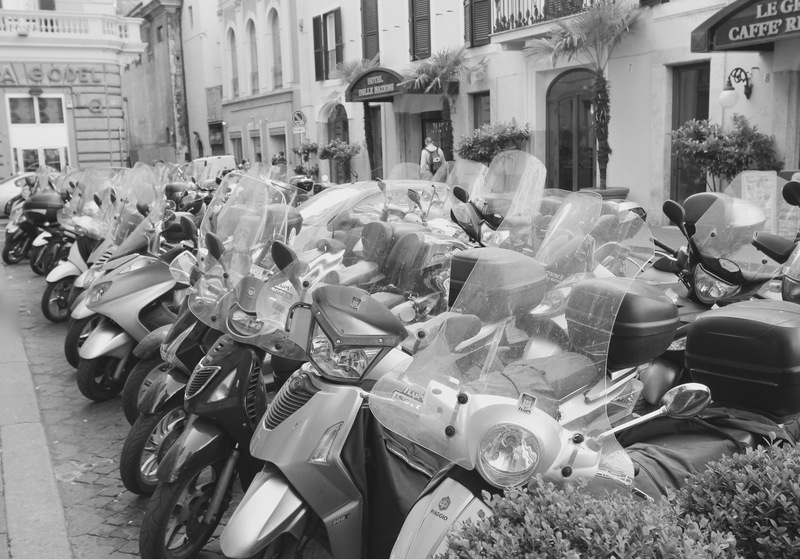 Driving…Just Don’t: Unless you plan to drive outside of Rome…DO NOT RENT A CAR!!! The drivers in Rome are nuts. I really think that street lanes, traffic lights, and pedestrian walkways are just merely there for a suggestion. You will have a street with 4 painted lanes of traffic and 7 lanes of cars with motorbikes darting in and out of traffic. The Rome Airport is about a 40 minute drive to the center of Rome, and the cost of a taxi is on par with the cost of a car transfer service. Since we had 4 people in our travel party, we arranged a car service with a van pickup, and our cost was only 55 Euros in total!! This is the third time we have used Fattori Car Service, and they have been great. Always on time and very professional. We also arranged for their service to drive us to the cruise port about 90 minutes away. The cost for the 4 of us in a van was 150 Euros. Eating: The best thing about food in Italy, is it is Italian Food! Ha! Imagine that!! If you love pasta, pizza, antipasti, then you are in heaven. There are so many street side cafes to choose. You will find a big difference in pricing though, especially if you are beside one of the main tourist spots. We had lunch in the Piazza Navona, and the cost of our meal was twice what we paid at the cafe a block from our hotel. And, the serving size was a little smaller. If you want to enjoy the view while dining then eating near the attraction is a great idea. However, for a little less money, just walk about 2-3 blocks away, as you are more than likely to eat where the locals do and pay a lot less for more. Section of the Roman Water Aqueduct. These structures were built to carry drinking water from far away water sources into the city. It worked because there is a slow gradient (downhill) from the water source to the end which allows gravity to transport the water. The longest of these were 50+ miles in length. Amazingly, some of the construction of these started 100BC, which is an amazing engineering and surveying feat to plan and build this infrastructure. Pickpockets: Being mindful of your surroundings is important, not only in Rome, but any large tourist city in Europe. Crime rates are very low in Europe, but what can be high are petty crimes like pickpocketing. Here’s the situation. You are at the Trevi Fountain, and you are taking a picture or throwing a coin in. It is a very busy place, and before you know it, someone has stolen something off of you by bumping into you. Our hints are for guys to wear money belts either under their waistband or around their neck under their shirt. And for ladies to have their purse strapped across their body instead of down one side and to keep it more toward the front. Also, it is a good idea to wear a lightweight shirt or scarf over it to further hide it from view. And, if you are in groups, to use the buddy system to look after each other in crowds, especially if anyone wears a backpack. 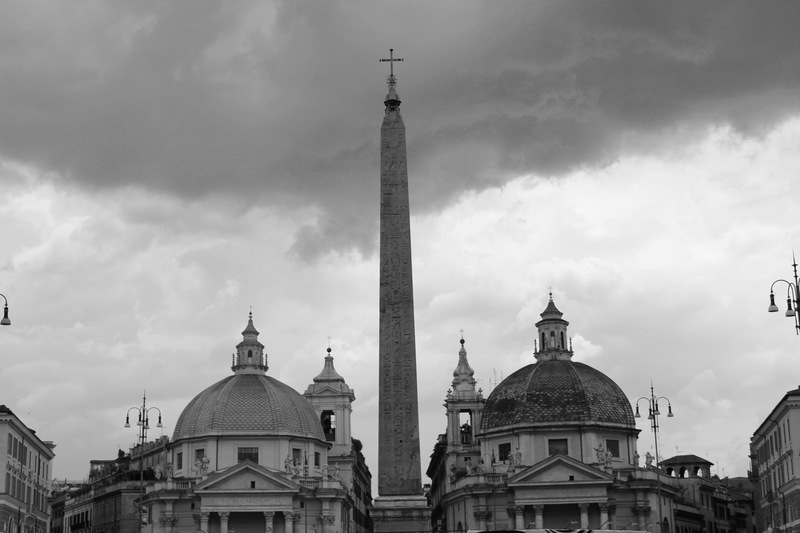 The Piazza del Popolo (Square of the Popes). 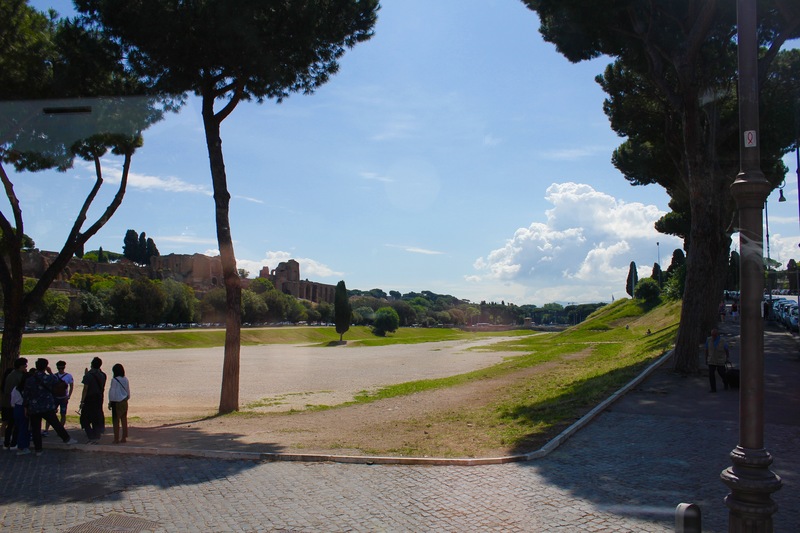 The obelisk here was once in the center of the Circus Maximus. Now, it is in the center of the square. 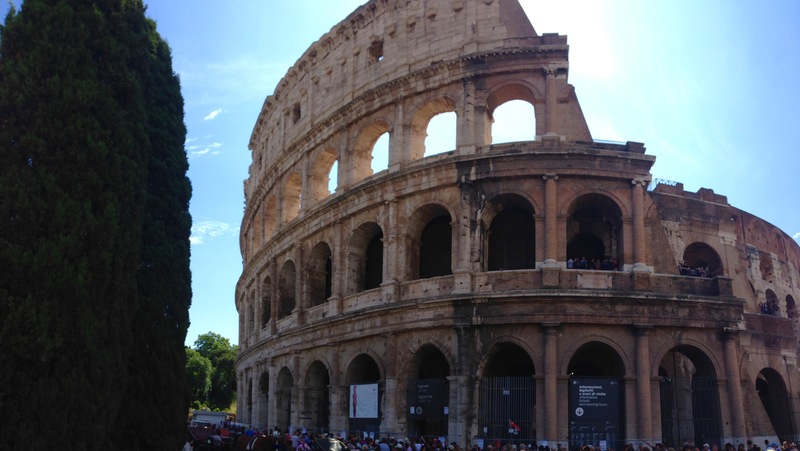 At the Roman Colosseum (Coliseum) built about 80AD….has to be one of the most iconic structures in the world. 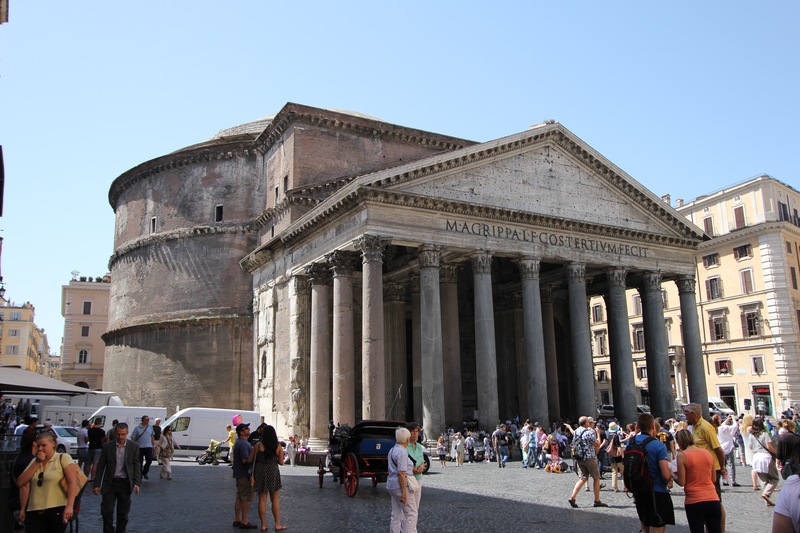 The Pantheon, meaning “of, relating to, or common to all the gods” was originally built about 20BC. Converted to a Catholic Church around 600AD. One of the oldest, intact, and still used buildings in Rome (if not the world!). 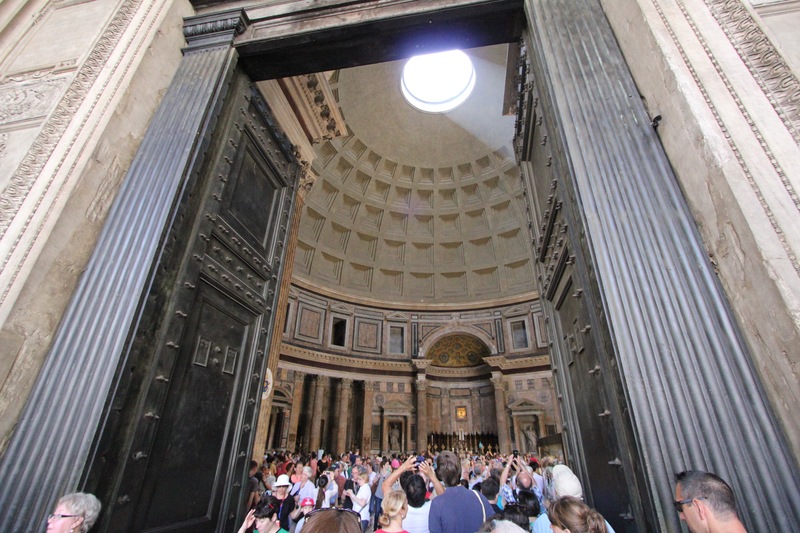 Entering the Pantheon through very large doors, you see the dome structure with the hole, which lets the sunlight inside. From my viewpoint as an engineer, this is the largest unsupported (no arches or beams) concrete dome structure in the world, which is a feat considering it was built 2000+ years ago. BTW, the hole is there so people can look up to God and so God can look down to the people. Rome is a beautiful city. It is right there with Paris as cities most likely that we will return multiple times again to visit. Each time we find a new place, and are amazed with this ancient and still vibrant city. 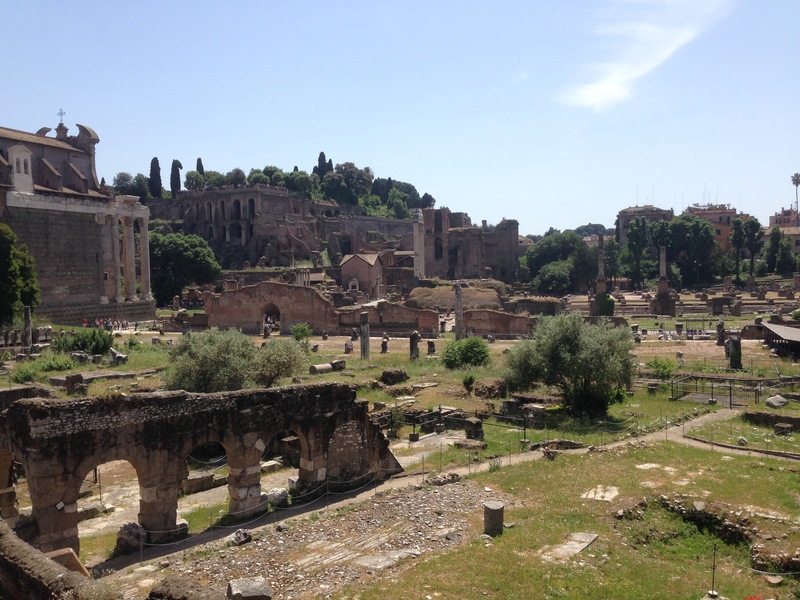 If you enjoyed this post, here is the link to our other blog post about our first visit to Rome in April 2013, and our first impressions of visiting this iconic city. 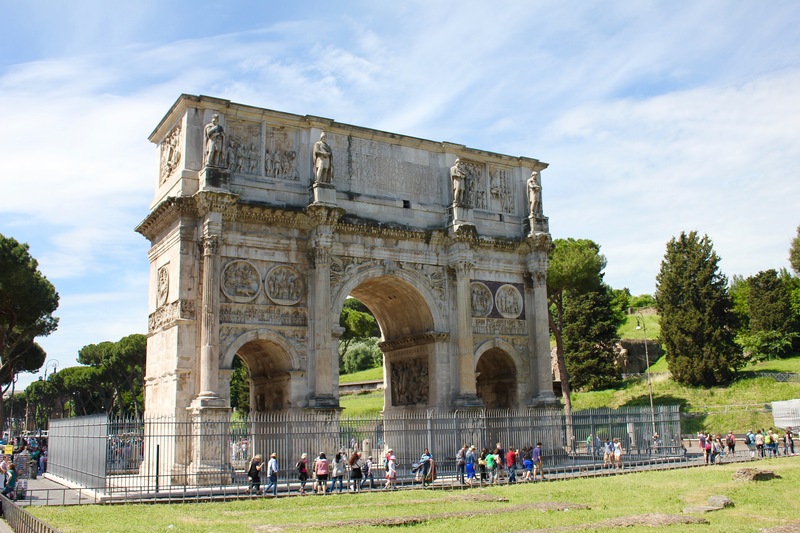 Beside the Coliseum is the Constantine Arch, built in 315 AD in tribute to Emperor Constantine’s victory in battle. Constantine was the first Roman Emperor to convert to Christianity….built a city for himself in the eastern part of the Roman Empire in modern day Turkey. The City is now Instanbul, but it was once called Constantinople (who gets the reference?). BTW, this arch was built in the 4th Century, and its design has been copied in a number of places, most notably the Arc de Triomphe in Paris. The Roman Forum area which would have been the “main part of town”. Historic figures like Mark Antony, Cleopatra, Julius Caesar would have all been here. Monuments dating back to the 7th Century BC. Just a hint: the oculus at the top of the Panteon dome is not really a “window” to God (or gods). 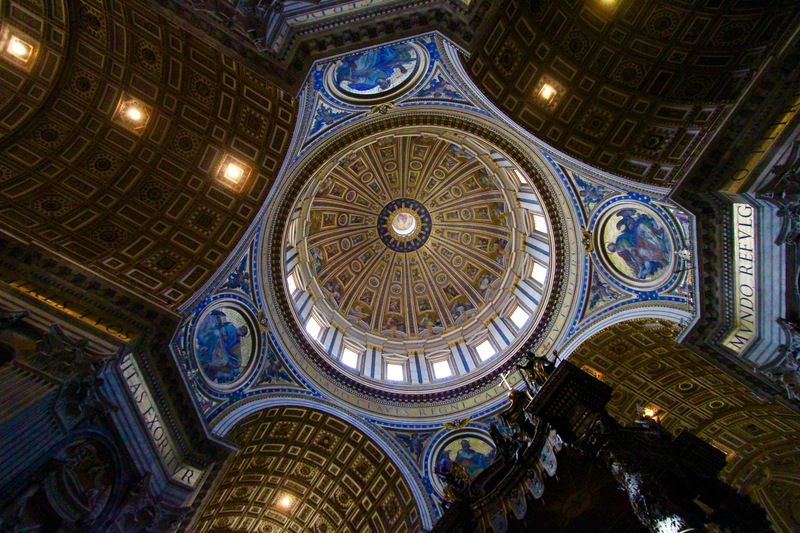 It was just an enginnering trick: the top of the dome was simply eliminated to avoid collapsing. I’m not sure if enough glass to cover the hole was available back then, so it was left as is. It’s also the only source of natural light in the interior, along with the entry door. I think it was used as some kind of clock/calendar as well. On the floor of the building you can see a drain to carry away rainwater, entering from the oculus. Thanks for the clarification! As someone who has worked in engineering and in marketing, I can relate to both the engineering/technical explanation and then can appreciate the marketing aspect of the oculus to the people over time to simply say, ‘yeah, that hole there, that’s the so God can see us and we can see God.’ And, it is pretty neat to stay inside for a length of time to watch the sun move across the floor. Thanks again for the clarification.